Get excited, our new lineup of planetarium shows begins this Tuesday! 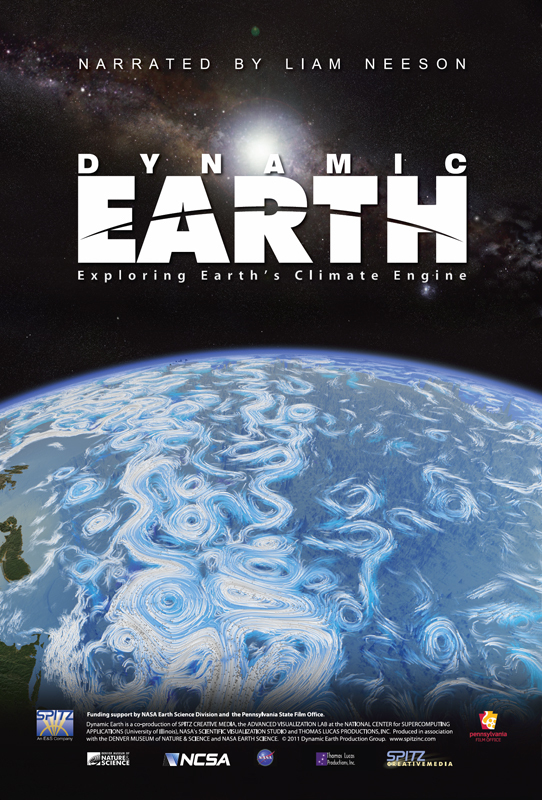 Explore the inner workings of Earth’s climate system. With visualizations based on satellite monitoring data and advanced supercomputer simulations, this cutting-edge production follows a trail of energy that flows from the Sun into the interlocking systems that shape our climate: the atmosphere, oceans, and the biosphere. Audiences will ride along on swirling ocean and wind currents, dive into the heart of a monster hurricane, come face-to-face with sharks and gigantic whales, and fly into roiling volcanoes. Explore Mars in High Definition thanks to Curiosity. Happy summer! Today is the Summer Solstice, our hemisphere’s longest day. 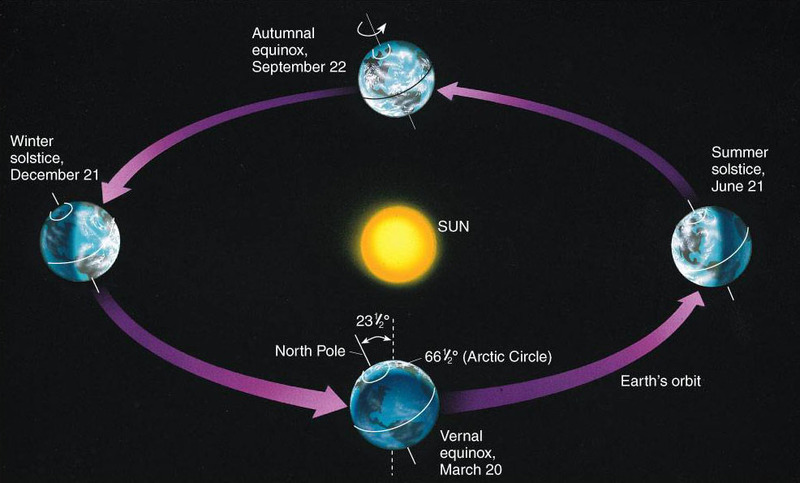 Our Earth has seasons because its axis is tipped about 23 degrees, in other words it isn’t straight up and down. As the Earth orbits the Sun, the tilt causes us to experience seasons. In the United States, we have summer when the northern hemisphere is tilting towards the Sun. The summer solstice itself is the day when the axis is tilted most towards the Sun. From the ground, we can see that the Sun takes the highest path across the sky, and we experience the year’s longest day and shortest night. As the Earth continues in its orbit, the axis will slowly tilt away from the Sun. Little by little, we will see the Sun take a lower path across the sky and the days get shorter. Once the Earth has reached the opposite side of the Sun, its axis is tilted away and we experience winter. What’s happening in the Southern hemisphere during all of this? Exactly the opposite! They are having their Winter Solstice today. “Coming up this weekend the moon will be full. To be precise, it will be full at Sunday morning at 7:32 EDT. 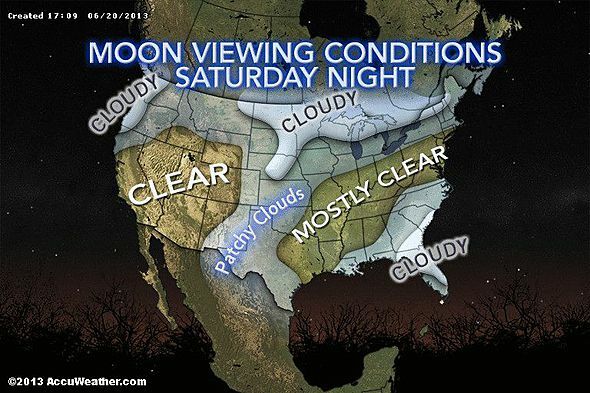 Because of the time that the moon is full, it will basically appear to be just as full Saturday night as Sunday night. 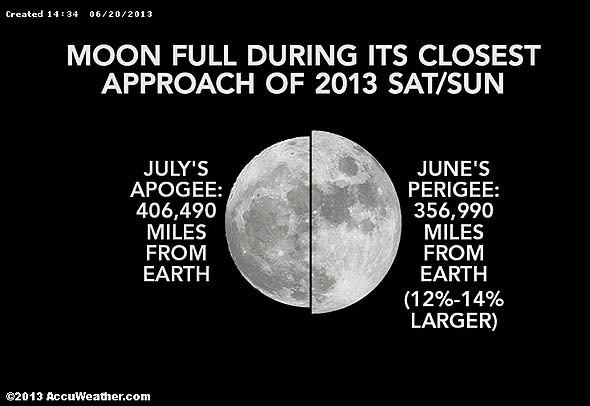 At the same time, the moon will make its closest approach to Earth (called lunar perigee) of 2013. Don’t believe the internet hype, the Moon will not appear drastically larger in the sky. The Moon will appear slightly bigger in the sky by a very small amount. It will be difficult to notice the difference without a comparison (see above image). A new or full moon at 90% or greater of its closest perigee to Earth has been named a “SuperMoon” by astrologer Richard Nolle. This term has made it to the field of astronomy as well as the mainstream media and Richard readily gives credit to us here at AccuWeather Astronomy on Facebook for helping this occur. Please visit Richard Nolle’s fascinating page by clicking here. His page is full of interesting information and I highly recommend it. An extreme “Supermoon” is when the moon is full or new as well as at its 100% greater mean perigee (closest) distance to earth. By this definition, the Supermoon this weekend will be an extreme “Supermoon”. This Supermoon will pass 356,991 km away from the Earth. In comparison, the March 2011 Supermoon passed 356,575 km away and the average distance between the Earth and the Moon at any particular time is 384,400 kilometers. 30 Years ago on June 18, 1983, Sally Ride flew into space aboard the Challenger mission STS-7. She was the first American woman to travel to space. She paved the way for 44 more American women who have so far become astronauts, in addition to countless more in the future. This year in 2013, four out of the eight astronauts are women. 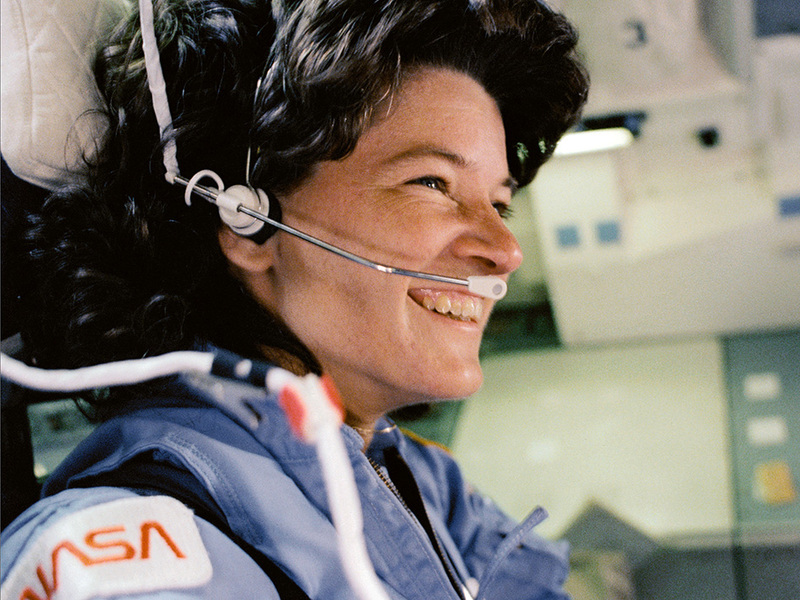 Sally Ride passed away last July, but she remains an inspiration to women in science. 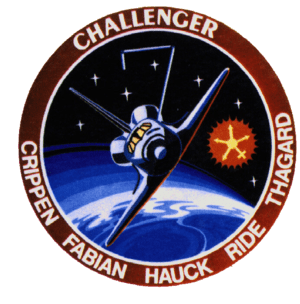 Mission patch for the STS-7 mission. Happy 10 Year Anniversary to the Planetarium! Hopefully you were able to see Mercury in the twilight sky over the weekend! Now see the first planet from the Sun up close… This awesome image was taken by the Messenger Spacecraft a few weeks ago. The border between the night and day sides of a planet is called its terminator. Look closely at the image… Notice in some of the craters there are central peaks. These happen when objects smash into the surface with exceptional force, this causes the land to deform downward then back upward again. (Imagine a droplet falling into a glass of water). 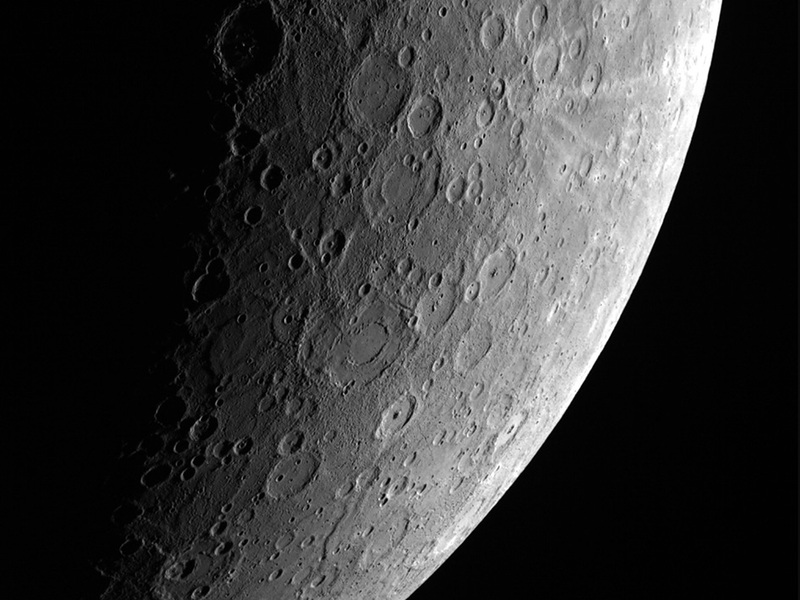 Messenger is studying the topography of Mercury using lasers. Remember how Mercury wasn’t very bright in the sky? In this image you can see that Mercury’s surface is rough and somewhat dark, you can see that Mercury is not a very shiny planet. Catch a glimpse of Mercury tonight! Mercury and Venus can be seen low in the western sky this evening. Make sure you have a clear view of the western horizon at around 9 PM tonight. Venus and Mercury will appear close together (Venus is brighter and to the right, Mercury is fainter to the left). Venus is larger and closer to Earth, and its cloudy surface reflects lots of sunlight. Venus can be the brightest night sky object except the full moon. Mercury is small, farther from Earth, and not very reflective so it doesn’t shine very bright in our sky. Tonight, a crescent moon is visible nearby. Watch over the next few days, and you will see the moon move higher in the sky. Our pair of planets sit near a famous pair of stars. Pollux and Castor are the two main stars in the constellation Gemini the Twins. Check back for frequent astronomy updates, behind the scenes tidbits, commentary on current astronomy events, and more… Also, if you have a question, let us know!